Land cost per person: Call for current pricing. Let us put our decades of Peru travel expereince to work for you! When you compare what's included, our trips are an unbeatable value. Note: Single Supplement is not included (if needed). Depart on any date! Bring your family or group of friends, celebrate your honeymoon or any other occasion. Choose any dates that fit your group and we will arrange your trip. Also see our 8-DayPrivate Wonders of Peru Itinerary. Don't miss the OPTIONAL hike along the Inca Trail to Machu Picchu on Day 4. Regulations limit the number of people on the Inca Trail. To ensure your spot we recommend that you reserve at least 5 months in advance! If you sign up for the trip after Inca Trail permits have run out, you can still join us on the departure, but you will not be able to hike the Inca Trail portion to Machu Picchu! If you are planning to do the Wonders of Peru Tour without the hike, no permits are required. You will be met at the Lima airport by an Andes Adventures representative, who will assist you with connecting flights to Cusco. Depart on a one-hour flight to Cusco, the ancient capital of the Inca Empire and the continent’s oldest continuously inhabited city. Upon arrival in Cusco, we transfer to the hotel where a traditional welcome cup of coca leaf tea is served to help with the acclimatization to the 11,150 feet altitude. This afternoon we enjoy a guided sightseeing tour of the city including the Main Square, Cathedral, Santo Domingo Monastery and Qorikancha, the temple of the Sun, once the most important place of worship in the Inca empire. Colonial chronicles describe it as having walls covered with gold plates to reflect the sun’s rays entering through a window especially positioned for that purpose. You will receive a tourist ticket valid for the length of the trip enabling you to visit the many archaeological sites, temples and other places of interest. Welcome lunch and overnight in Cusco. 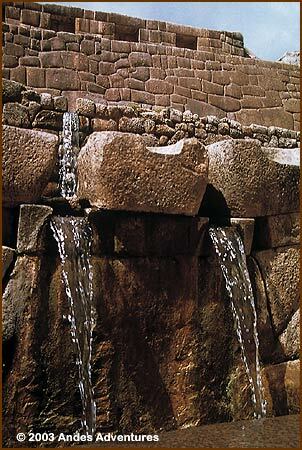 Costa del Sol Ramada Cusco (Previously Picoaga Hotel) ­ L, D.
Morning visit to the archaeological sites surrounding Cusco, beginning with the fortress and temple of Sacsayhuaman perched on a hillside overlooking Cusco at 12,136 feet. It is still a mystery how this temple was ever built. Gigantic stones, some of them weighing 125 tons, were carved into huge trapezoidal blocks that fit together with extraordinary precision. The tour continues with visits to the semicircular shrine of Kenko, Puca Pucara and the Royal Baths of Tambomachay, a beautiful ceremonial bath, formed by four leveled walls linked by stairs and adorned with waterfalls which continue to flow 500 years after being built. The rest of the day is for relaxing, shopping, sightseeing and enjoying Cusco and its surroundings. Costa del Sol Ramada Cusco (Previously Picoaga Hotel) ­ B, L, D.
Our tour takes us on a scenic drive to Urubamba, the “Sacred Valley of the Incas”. We travel across a high plain with splendid views of the Cordillera Urubamba to the ancient Inca town of Chinchero at 12,350 feet. Chinchero is a picturesque community that combines both Inca and colonial architecture. The campesinos of this region still use the weekly market for trading food and other items, using the original method of exchange “trueque”. Shop for local handicrafts and if time allows we will observe a demonstration of the traditional weaving process. We continue on to visit the salt mines of Maras and hike down a scenic trail to the Sacred Valley where transportation will be waiting to take us to the hotel. The 2 hour hike is optional. After lunch we will visit the village of Ollanta and Ollantaytambo, the best surviving example of an Inca town. 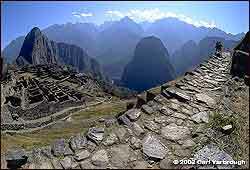 Most of its buildings sit upon Inca walls and the street plan is still the original laid out by its Inca builders. 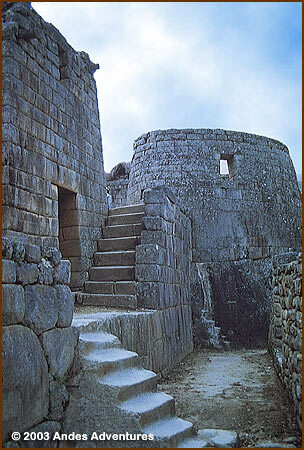 Its stonework, narrow cobbled streets, family courtyards and water system is exactly as it was built in Inca times. You will be able to appreciate the Inca agricultural terraces that create small tiers of fertile land on very steep slopes. We spend the rest of the day relaxing in Yucay and its surroundings. Sonesta Posada del Inca Hotel in Yucay, Peru's Leading Boutique Hotel in 2011, 2012 and 2013 (World Travel Awards). B, L, D.
See note regarding Inca Trail permits at the top of this itinerary. This morning everyone in the group travels by train along the Urubamba River to Chachabamba at Km 104 (7,200’). Here the participants that have selected to do the optional hike to Machu Picchu will get off the train and start their hike, and the rest of the group will continue by train to Aguas Calientes, at the base of Machu Picchu. You must let us know in advance if you plan to do the 7 mile Inca Trail hike to Machu Picchu, or continue on the train and follow the traditional route to Machu Picchu. We cross the hanging bridge over the Urubamba River and hike uphill, passing Chachabamba. Along the way there are views of sparkling cascades and lush vegetation. After about 3 hours of moderate hiking we reach the site of Wiñay Wayna “Forever Young” at about 8,400 feet. Descending into the cloud forest, we are surrounded by exotic varieties of plants, orchids and flowers. We continue for about 2 hours along a mostly shaded trail to Intipunko “Gateway of the Sun” at 8,860 feet. Suddenly, the full grandeur of the world’s greatest ruins are revealed: the domed peak of Huayna Picchu, and the Lost City of the Incas  Machu Picchu  at 7,900 feet. A 40 minute walk brings us down to Machu Picchu. If you are not hiking, you will continue on the train to Aguas Calientes. 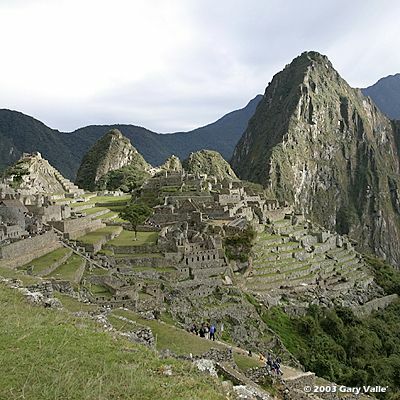 The guided visit will be the next day and you will spend the entire day visiting Machu Picchu. If you want to hike the Inca Trail, to ensure your spot we recommend that you reserve at least 6 months in advance of departure! Today’s optional hike: About 7 miles, or 5 to 6 hours. El Mapi Hotel Machu Picchu ­ B, L, D.
We spend the early part of the morning with our expert guide touring the mysterious city, its magnificent temples, terraced hillsides, irrigation channels fountains, elaborate stone work and chambers of unknown purpose. 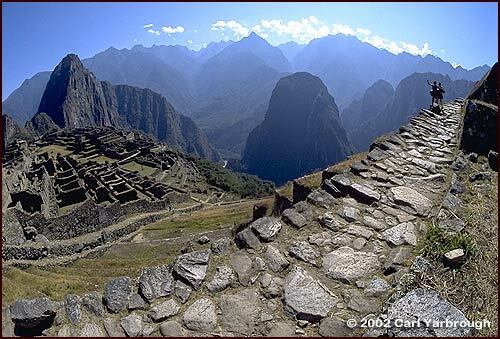 As we listen to the theories about the mysteries of Machu Picchu, we wonder how and why this city was built in such a remote place and what its purpose might have been. Fortunately, this outstanding citadel was never discovered by the Spaniards and was spared from destruction. Continue exploring the ruins of Machu Picchu, or relax in Aguas Calientes. You may also choose from several additional (unguided) activities such as a moderate hike to the Inca Bridge; or an optional climb to the airy summit of Huayna Picchu at 9,000 feet (the optional climb has to be arranged in advance). This morning we board the train to Urubamba and continue by bus to visit the Andean village of Pisac. Our guide takes us through the village to visit its colorful market where extensive selections of colorful weavings, ceramics, sweaters and other handicrafts are sold at bargain prices. The afternoon is free for last-minute shopping and enjoying Cusco. Tonight we will have our farewell dinner in one of Cusco’s finest restaurants. Day Room: Hotel San Agustín Exclusive in Miraflores - B. • All sightseeing tours and entrance fees to destinations on the itinerary. • All accommodations are in comfortable fine hotels, based on double occupancy, 2 persons sharing a room. • The services of professional English speaking tour guides and expert trip leader. Our local leaders and guides are knowledgeable about the language, customs, culture and history of their country. They are detail oriented and take great pleasure in sharing their insight and expertise. They make sure everything runs safely and smoothly. • International airfare, internal flights, transfers for independent arrival or departure, travel insurance (highly recommended) for which an application will be included with your confirmation, passport fees, excess baggage fees, optional tips to trip leader, guides and local staff. All items of personal nature such as: laundry, telephone calls, beverages, etc.